Size: 30x45cm x 1 piece / 12x18 inch x 1 panels. All canvas wall art are wrapped on frames, bracket mounted, protected by plastic bags and carton box. - For single piece, drive a nail, aim the bracket and hang. - For multiple pieces, arrange the positions, draw the center point on its top line, and then nail 3/5-inch under the point, aim the bracket and hang. P.S. : The bracket has sawtooth for balance adjustment. - We would like to accept return and refund for you, please contact us by "Sold by Piy Painting" then "Ask a question"! - If this canvas picture scratched or damaged, please help tell us ahead and it doesn't affect the refund. Our canvas prints can also be custom-made for your own size, photos or pictures, contact us by "Sold by Piy Painting" then "Ask a question"! This museum-quality wall art uses for living room, bedroom, kitchen, dining room, bathroom, hallway, guest room, sitting room, office, cave, dorm, hotel, cafe, restaurant, bar, guesthouse, KTV, Gym or upon fireplace, behind couch in your nice house. - This is an modern decorative way to highlight your unique artsy taste. - Stunning home decorations that earning compliments from your guests. - Contemporary wall paintings for any space to remove boring blank. - Bring in a peaceful dream world that relaxing and inspiring your family everyday. There's one more canvas painting to make your new home completed. Even a small warm piece can make a difference in your life. You can order and check this inspirational wall art, love it or your money back. Let's wake up your wall, "Add to Cart" now! 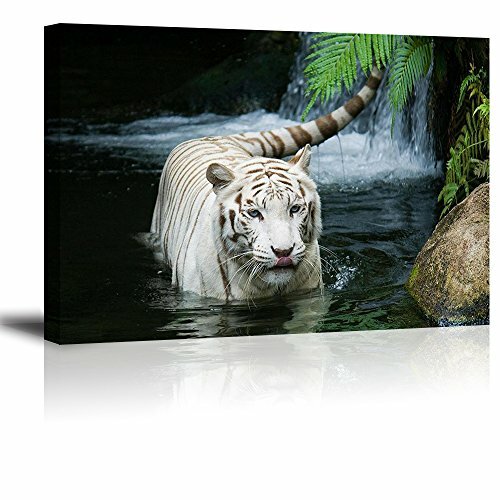 1: Beautiful tiger canvas wall art printed and framed by PIY Painting. The artist-grade canvas has strong sense of texture and full of artistic touch, reflects your noble temperament and taste. This canvas picture dimensions: 30x45cm x 1 piece = 12"x18" x 1 panel, bigger than A3 size. 2: Waterproof and Environmental Friendly: UV-resistant & ECO-ink print on canvas, easy to clean by damp rag and no smell of oil paintings, more safety and environmentally for kids. Modern giclee canvas prints artwork used for a variety of photographic and hand drawing pictures. 3: Premium durable frame with 1 inches/2.5cm thickness, more than the others' 1.8cm. Shrink resistant and strong sense of three-dimensionsal. It's the perfect wall decor painting for your nice home living room, boys or girls bedroom, kitchen, dining room, bathroom, hallway, guest room, sitting room, office, cave, hotel, cafe, restaurant, bar, guesthouse, KTV, Gym and so on, launch the elegant artistic atmosphere. 4: Easy for installation: Our canvas wall art comes already wraped with bracket mounted frame and ready to hang. All you need to do is find a nail and hang up this beautiful picture in your new home. The other prints in the market, you have to screw the accessaries by yourself, that's not so easy without professional tools. 5: 3 years workmanship guarantee, no worries with 365 days customer service: The canvas painting is packed in cartons and each panel equipped with plastic film package. Protected products can be better to avoid damage. This inspirational wall art is a great choice gift for your families, friends or your lover in birthday, wedding, anniversary, festival, Halloween, Christmas, etc. If you have any questions about this product by Piy Painting, contact us by completing and submitting the form below. If you are looking for a specif part number, please include it with your message. Frogs in the Bathroom Picture on Stretched Canvas, Wall Art decor, Ready to Hang!